Trust me, this isn’t your mother’s salad! 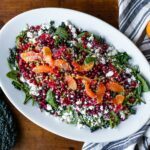 It’s a delicious blood orange, pomegranate, and wheat berry salad that’s chocked full of unique flavors and drizzled with a champagne and blood orange dressing! Start by cooking the wheat berries. In a large kettle, combine the wheat berries, 3 1/2 cups of water and 1 teaspoon salt. Bring to a boil, reduce to a simmer, and cover with a lid. Cook until the berries are tender, 45-60 minutes. When tender, drain the wheat berries and set aside to cool. In a large bowl, make the dressing. Whisk together the olive oil, blood orange juice, Dijon mustard, vinegar, salt, and pepper. Add the prepared kale, spinach, arugula, mint, and scallions. The kale acts as a barrier for the spinach and arugula and can sit on the vinaigrette up to two hours before tossing the greens in the dressing. When ready to serve the salad, toss the greens with the dressing and place on a large platter. Sprinkle with the prepared wheat berries, scallions, pomegranate arils, sunflower seeds, and feta cheese. Do not toss all the toppings as they make a beautiful presentation.